Plagued by insomnia, I’m seeking ways to entertain myself until I either grow sleepy or the morning sun washes away all hope of sleep altogether. The Kansas City joke below is a bit of a stab in the gut, as a Royals fan, though I can hardly deny how true this was for so many years. The phone would ring in the middle of the night and you knew it was either Mr. Steinbrenner or a death in the family. After a while you started to root for a death in the family. The first documented baseball game in Cuba took place on December 27, 1874 at Palmar de Junco. In the contest, a team from Havana squared off against one from Mantanzas. The game was called after seven innings, due to darkness, with Havana leading 51-9. Check it out, even Santa likes baseball! Here’s hoping everyone has a fun-filled and fulfilling holiday season. 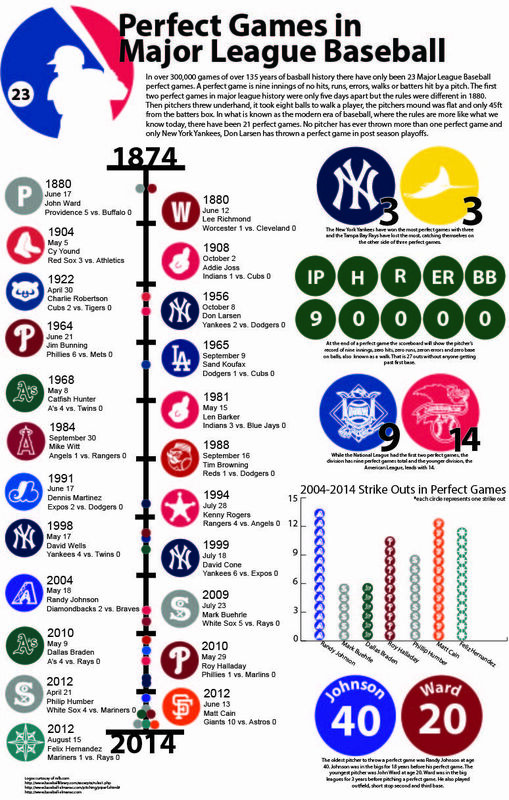 Here’s a chart that depicts perfect games throughout baseball history, beginning in 1874. The fact that there have only been 23 perfect games thrown in the hundreds-of-thousands of games that have been played in Major League Baseball goes to show just how difficult a feat it really is. Three perfect games in 2012 is an especially astonishing number, with this in mind. I have a vague memory of watching this short toon as a kid. The part I remember best is the bit about Bugs playing catcher to his own pitching. I found myself wishing that I was fast enough to do that, especially considering how hard Bugs seems to be hurling those fastballs.